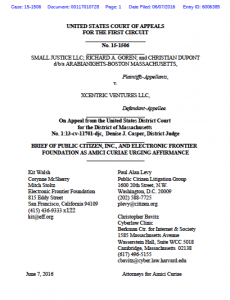 The Cyberlaw Clinic supported Public Citizen and the Electronic Frontier Foundation in filing an amicus brief (pdf) today in the case, Small Justice LLC v. Xcentric Ventures LLC, Case No. 15-1506, pending before the United States Court of Appeals for the First Circuit. The case raises important questions about the interplay between copyright law and laws protecting free expression, including the immunity granted to platforms that host content uploaded by users pursuant to Section 230(c) of the Communications Decency Act. 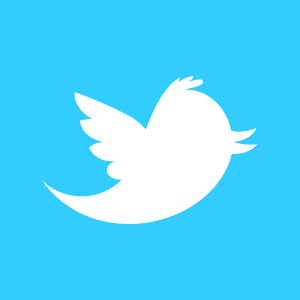 Paul Levy of Public Citizen and Kit Walsh of EFF wrote detailed posts about the brief. The case has a long and somewhat convoluted history, arising from a report entitled “Complaint Review: Richard A. Goren” (“the Report”). The Report was posted to the consumer reporting website Ripoff Report on January 31, 2012. Mr. Goren filed a defamation lawsuit against the pseudonymous poster of the Report, and a justice of the Massachusetts Superior Court ruled that the copyright in the Report should be transferred to Mr. Goren. Mr. Goren and his company, Small Justice LLC, then used the transferred copyright in an attempt to enforce rights against Ripoff Report’s parent company, Xcentric Ventures, and have the review removed. Fall 2015 Harvard Law School Cyberlaw Clinic students Charles McGonigal and Will Piereson and former Clinical Fellow Andy Sellars, along with the Clinic’s Managing Director Christopher Bavitz, contributed to the brief.